Oh dear … things are getting serious around here. 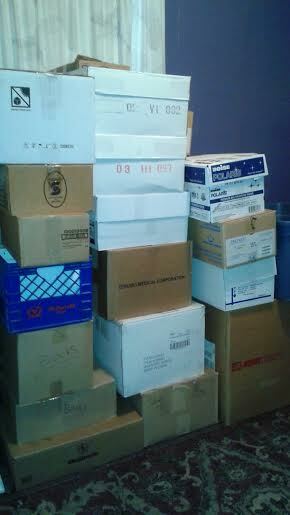 There are stacks of boxes and bins for the moving truck. No matter what…..those 3 words we use quite often in our day-to-day lives. Are you in a challenge? Or facing a struggle? A test? Trial? I have faced challenges before, as I am certain you have as well; but with each test comes the struggle. The struggle of knowing what to do. The struggle of trusting the One who has promised to help us. So we remind ourselves again of how we managed the last one and that we will not be left alone during this one. Life is full of ups and downs. My goal: to smile on the way up and the way down! One of my trips to see my mother took place in January. She lives in north central California, about an hour south of Sacramento. The flight was non-stop (Yay!) early in the morning. The sun was coming up as I left St. Louis and it was beautiful. During the entire flight the sun was blazing. I wanted to put the shade down by my seat, but I didn’t. It was too lovely. The sun beams brilliantly bouncing off of the heavy cloud floor. My youngest daughter got married a couple of years ago. We did the wedding ourselves and it was lovely. She is very crafty and creative so not one person in attendance was surprised at the loveliness they witnessed. 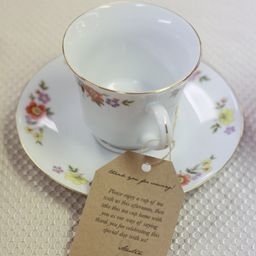 One of the things she wanted was to have a china tea cup and saucer for every guest. They could have tea or coffee in a lovely cup and then take it with them as a memento.